Not all memory cards are created equal. With all the marketing names and jargon, sometimes it can be difficult for consumers to actually know which memory card they need. 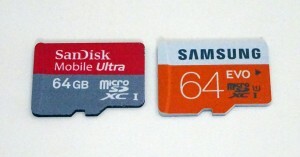 This post is about speed comparison of 2 micro SDXC memory cards: Sandisk Ultra Mobile 64GB and Samsung Evo 64GB. For this test, I use a Mac mini with built-in USB 3.0 ports. The memory cards are accessed through a USB 3.0 memory card reader (Transcend RDF5). Both Sandisk Ultra Mobile 64GB and Samsung Evo 64GB are rated as Class 10 and UHS-I enabled with promised speed “up to 40 MB/s”. Theoretically, these two memory cards should have similar performance. Data A is 1 large file. The size is 4.25 GB. Data B is a set of 12 medium files. The total size is 5.81 GB. Data C is a set of 45,976 small files. The total size is 5.47 GB. Testing process is simple. First I formatted each memory card using ExFAT so at the beginning of the test, they are empty. To measure WRITE speed, I copied each set of data into each memory card and timed the process. To measure READ speed, I copied back those sets of data back into my computer and timed the process. As a bonus, I do the same test using the same data to an old V-Gen micro SDHC 8GB class 4. As expected, copying a lot of small files take significantly longer time because there are additional process that must be completed for each file. READ operation always faster than WRITE operation for the same set of data. Samsung Evo performs impressively faster in almost every test, making it a clear winner of this comparison. It is worth to mention that there are 2 types of Sandisk Ultra micro SDXC cards in the market. Some products is branded as “Sandisk Mobile Ultra” and some other are simply branded as “Sandisk Ultra”. I am not sure what are the actual differences between the two models. A quick Google search gave me various results. Some people said they are actually the same product, just different marketing strategy to show people that the memory card would work in mobile devices. Some others said that Sandisk Mobile Ultra is the older model and therefore must be slower. I can’t really conclude anything from so many untrusted sources of information, and I can’t do a test using something I do not have. So this is the best result I can show. Unless someone is willing to donate a Sandisk Ultra 64 GB micro SDXC card for me to test. I redo this experiment using ChronoSync 4.6.2 to copy the files, this app allows me to write a large number of small files considerably faster. Cool. I was about to buy a wrong microsd. U save me dude. Don’t have to look to other benchmark after this review. Thank you! This straightforward, easy to understand (even at a glance) comparison is exactly what I needed! Thank you for this information I was looking for an answer because i wonder which one of them to buy. Hi! Could you tell me the allocation size (cluster) used in the formating process for both cards?